This plant is useful in shady areas and has tiny white flowers in the winter followed by shiny black berries. it is in an ally which leads to my front door so the perfumes gets blown away and have repositioned it into a more protected area and will under plant it with shade loving flowering plants I have planted it in a discarded which is green coloured refuse bin used normally for recycling bottles and plastic containers its a useful size for growing salads etc. There must be lots of them around because the lids are quite fragile and they do not make spare ones when they are damaged so a lot of useful plant containers. Second sarcococca purchased. Lovely glossy leaves and arching stems with fragrant flowers, a lovely plant for a shady garden, plant where the fragrance can be appreciated. The leaves have started to drop from the lower branches. Is there any need to be concerned? Hello, It is not unusual for evergreen plants to lose some of their older, lower leaves as they put on new top growth, so unless the leaf drop is extreme, then I would not be concerned. Hi purchased this sarcococca from Crocus in August. Planted in pot near front door as no planting space in shady front garden. Plant is doing really well flower buds about to open. My question is when will the best time be to move it from pot to garden as I now have space having dug up some old fuschias. I assume it is best to leave it in pot until ? Spring . Is this correct. Look forward to hearing from you. Many thanks for your help and the lovely healthy plant . Hello there Fully hardy container grown plants can be planted out anytime as long as the ground isn't frozen, or freezing outside or the soil waterlogged, but as you planted it up in August into a larger pot, I would leave it now and plant it out in the spring. This also means that you can enjoy the scent by your front door through the winter. Can you advise what is the best time of year to plant this out (from a 2L pot)? Also whether several plants can be planted side by side to make a hedge, and if so how far apart they should be planted. Finally I note the full grown height is about 2 metres; can this be curtailed to 1m or so with pruning? Thanks so much. Hello, These plants are fully hardy so can be planted out at any time of the year. Traditionally the best planting times are spring or autumn, but you can plant in winter provided the ground is not frozen, or during summer if you make sure they are kept well watered. They do make an excellent, informal hedge and can be clipped to keep them relatively compact. If you want to plant them as a hedge, then I would recommend planting them at 30-45cm intervals. Can these be pruned into a ball shape, like with Buxus? Hello, These plants will cope with a little light pruning, however I would not recommend them for topiary. Would this survive in a slightly sheltered,South facing slope 800 feet up in the Highlands? Soil is acid, mostly glacial pebbles and sand with a layer of leafmould on top. Oh,and we are infested with rabbits. 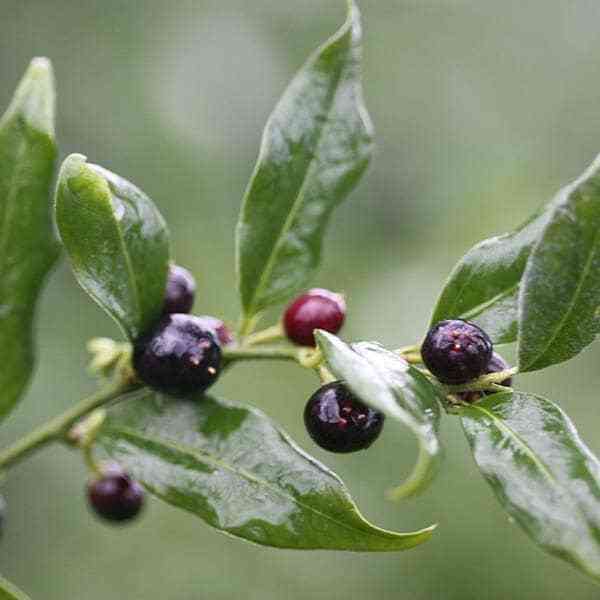 Hello there Yes Sarcococca will grow in acid, neutral or alkaline soil. Hope this helps. Would you put this, or any Sarcococca, in a container? How well might this do in a south facing, sunny spot? Hello there No I wouldn't plant this in an south facing sunny garden,- it really needs a shady, moist well drained soil. Sorry to disappoint you.